SCROLL DOWN TO SEE THE SUB NEEDS. Welcome to St Philip Neri Catholic Church Adoration Ministry. Our Adoration Chapel is now open from 10:00 am Tuesdays until 5:00 pm Saturdays. You are welcome to come and spend a few minutes to an hour or more with the Lord during this time. This is made possible by about 100 or so committed people who have taken up an hour or more each week. We have at least two people for most of the hours, but some hours have only one person. This page will show any open slots available each week where we need a Sub. If interested in spending an hour with the Lord, please scroll down and use this sign up sheet. Once you sign up, please make sure you go for Adoration for that hour. If you are new please read these guidelines. Sign in when you arrive. Sub Adorers' names may not be on the schedule. Plan to arrive 5 minutes early. Remember the reading material is there for your use and is not to be taken out of the Adoration Chapel. Let the candles burn all the way out. Replace the candles only after they burn all the way out. Do not place any extra candles on the altar other than the four already there. Candles are a fire hazard, and should only be placed in a slot on the metal stand. Please - No food (including gum) or drinks of any kind in the Adoration Chapel at any time. There is a bottle of water in the bookshelves for emergency purposes only. No material donations (such as statues, books, flowers, pictures, leaflets etc.). See Fr. John first. No miscellaneous notes on the sign in table. No money at any time is to be given out to people at the Adoration Chapel. Out of respect for other Adorers there is to be Silent prayer only in the Adoration Chapel. Turn off all cell phones before entering the Chapel. 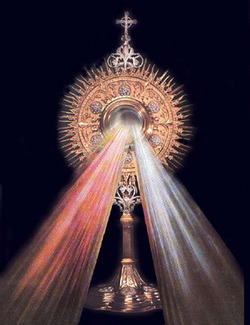 Cover the Blessed Sacrament (Monstrance) if no one else is there & you must leave. (Please follow instructions on Covering The Blessed Sacrament with the RED COVER cloth). The Adoration Chapel schedule is automatically suspended during icy weather or dangerous road condition. During any regularly scheduled Mass, including any Mass scheduled during Holy days of Obligation, the Adoration Chapel will be open, but Adorers are not scheduled. The Monstrance is to be covered with the Red Cover cloth, and the candles on the altar will be blown out. After Mass Adorers are to uncover the Monstrance, return the Red Cover to the bookshelves, and light the candles on the altar, so that Adoration can continue as usual. During any Funeral Mass, the Adoration Chapel always stays open for its regular schedule of Adorers. Adoration (in a holy hour) is a period of meditation, prayers and devotion in the presence of the Holy Eucharist exposed on the altar. There is no fixed way to spend the hour- the adorer will probably experiment with many. In a sense it is continuation in time of the moment of elevation at Mass, when the priest shows the host to the people, who pause momentarily in adoration. There are no hard and fast rules to follow, but here are some customs to guide your initial visit with the Lord. Upon entering make a profound reverence. This is typically done by making a "double-genuflection", that is, drop to both knees and lower the head a few inches in profound respect. Please be quiet and make as little noise as possible, unless you have a group signed up for specific purposes (rosary, divine mercy chaplet, etc.). If alone, feel free to vocalize your prayer. You may kneel, sit or stand. Create a little plan to divide the holy hour. Some divide the period into four blocks of fifteen minutes (adoration and thanksgiving- rosary- intercession and pondering- spiritual reading). You will find your own way, but don't hesitate to ask a priest or deacon, or anyone spiritually mature, to offer direction. And make good use of the books available. At the end of your holy hour, again make a double genuflection and leave without distracting others.